However, I prefer to have servers just download updates and let me decide when to install them. There can be good reasons for this. For example, I run Exchange Server on a machine that is not really up to spec, and the Exchange services have to be manually started every time it reboots. Well, there are ways round this, but it makes the point. The sconfig menu will be familiar if you have worked with Server Core or other variants of Windows Server without a GUI. 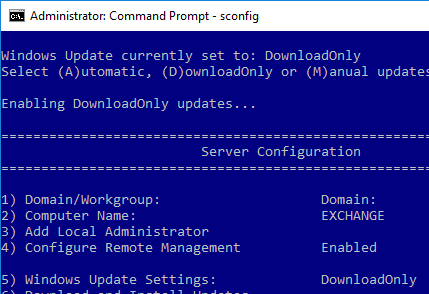 Incidentally, I tried to install Exchange 2016 on Server 2016 without a GUI but it appears not to be supported. A shame. The "Available updates will be downloaded…" text in the UI is a bug that doesn’t represent the actual automatic update settings. 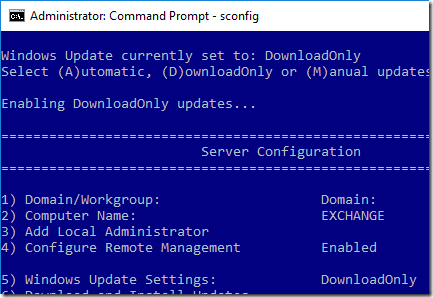 To verify the actual server settings, you can open the command prompt and run sconfig.cmd; in the menu, you should see option 5 set to Manual. A bug? I am not sure. If so, it seems an odd and obvious one. I think Microsoft is keen to have us update automatically. That said, Windows Server 2016 is meant to follow the Long Term Servicing Branch (LTSB) model rather than the “Windows as a service” approach in Windows 10, unless you run Nano Server, according to this post. So compulsory update to retain a supported configuration does not apply here. Of course you should patch your Windows Server installations in a timely manner, however you choose to do it.